Android is an opensource platform owned by Google. Developers can use this platform to build custom Android builds. Various developers or smartphone companies have build custom Android builds based on Android. These builds are known as custom ROMs. Custom ROMs are important because it allows you to use your smartphone in the better way and get more features than you get with stock Android. If you just need customization, you can use Android Launchers, but having custom ROM can give you lot more than just customization. The most notable thing you can do with custom ROM is that you can install the latest Android OS before your device manufacturer sends you the update. Most of the device manufacturers now use a custom ROM to give you a unique brand-specific experience. If you think your device’s default ROM is slow, you can switch to another ROM. If you are also looking for Roms for older Android devices, you can see this article to and select one. 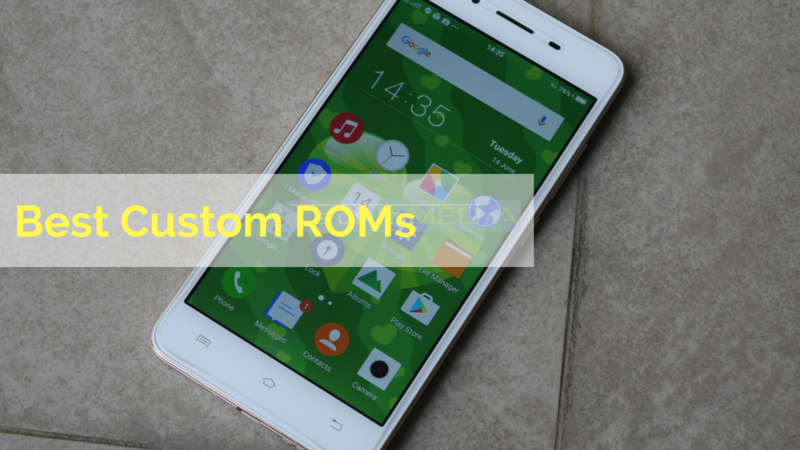 Before you read about best custom ROMs, you must know that it requires root to install a custom ROM on a phone. Rooting a phone might void the warranty on your Android smartphone. Only a few smartphone companies allow users to root. These are best custom ROMs available for Android devices. Try these custom ROMs if you want to get an open and customizable experience on your Android phone. CyanogenMod was quite popular with millions of active users. But the company shutdown OS and services last year. However, CyanogenMod never died and it came in the form of Lineage OS. Now it has more than 1 million active downloads. Lineage OS also comes with lots of features, privacy options and good options to customize the device. If you are looking for custom ROM, Lineage OS can be a good choice. Paranoid Android is another good custom ROM for your Android phone. It aims to improve your stock Android experience. It gives you beautiful interface and allows you to customize as per your interest. It comes with the number of cool unique features including cool immersive mode, hovers notifications, peeks notifications from the lock screen and several gestures. This custom ROM is officially available for OnePlus, Oppo and Nexus devices, but you can get it on other phones through unofficial channels on XDA. MIUI is well known because Xiaomi phones are quite popular these days. Xiaomi not just use MIUI on its phones, but it also allows other people to use this custom ROM on their Android devices. MIUI comes with a beautiful interface and offers lots of security and privacy features. It also comes with MI Cloud integration to offer easy backup of your device. For customization option, Xiaomi has partnered with various designers and photographers to give MIUI users best themes and wallpapers. Resurrection Remix is regularly updated custom with good performance and nice features. It lets you personalize your phone. You have options to customize lock screen, notification drawer, navigation buttons and animations. You can tinker with every element in the interface. If you like to play around everything on your phone, you must try this once. XenonHD aims to offer performance. It offers similar customization tweaks that are available in other custom ROMs, but the primary focus of this custom ROM is the snappy performance and smooth Android experience. It brings layers based RRO theming that allows you to customize the whole interface according to your need. It also offers features like built-in root access, privacy guard and more. It is not a feature rich Android ROM, but it is one of the those that offer smooth performance. OmniROM is another niec custom ROM you must try once. It comes with a unique feature called OmniSwitch. OmniSwitch is a quicl launch menu that allows you to jump to and from nearly every facet of your phone with a flick of the finger. This makes navigation a phone faster than you have experienced in any other custom ROM. Other notable features are DSPManager, OmniJAWS weather service, dark mode UI, quick settings panel, enhanced Do Not Disturb mode along with customization options. OmniROM is available for various devices including devices fro, LG, Samsung, Asus, Oppo, Sony and Nexus. Euphoria OS is another popular custom ROM based on Android. It was previously known as Mahdi. Like other custom ROMs, it also offers several customization options, privacy features, LED managers, various gestures and more. This custom ROM uses custom kernal that brings good performance and improved battery life by under clocking the phone. BlissPop is a notable lollipop based ROM with good features. It packs all tweak settings in one place to make your settings page cleaner. It offers status bar configurations, lockscreen shortcuts, battery styles, left-handed mode, navigation rings, and LiveDisplay. You can customize all the interface as per your interest. Cataclysm is a marshmallow based custom ROM with lots of features and solid performance. It offers features like configurable toggles, customizable lock screen, notification customization and more. This custom ROM has known for offering great performance but is only available for Nexus devices officially. You can install it on other phones from unofficial channels like XDA. Dirty Unicorns is also a good custom ROM for Android phones. You can easily customize your phone with available features. It offers lock screen wallpaper changer, color customization option, notification customization, smart bar and more. This custom ROM supports a wide range of phones. So, you should also try this once and experience the customization options this custom Android ROM offers. There are several other custom ROMs available for Android devices. But I will recommend you to try the listed above before thinking to try other. These custom Android ROMs offer lots of features and they are stable to perform well. You get lots of customization option. These ROMs can also be installed on older Android devices. So, if you are search ROMs for older android phones, you have a list to explore. If you have used any other custom ROM that is not on the list but offered you nice experience, you can share the name with us in comments. I will surely add that to this list.